Ah yes! We had just finished the Part 1 of the Pre ‘London International Wine Fair’ Conference on “Understanding the UK Wine Market”. We learned lots of things going on and being talked about in the wine business world, and obviously in the UK … great! So after coffee/wine break we were moving on to my FAVORITE part of the conference!!! I mean, it should come as no surprise to you that I am interested in anything involving the combination of wine and internet!!! Hello! I am a wine blogger! I am also ALL OVER Facebook, Twitter, LinkedIn, YouTube, and recently Flickr, Vimeo, Posterous, Adegga, whew! I just read an article the other day in which they called people who have never used the internet before ‘digital virgins’. I do NOT want to know what they would call me … ‘digital ________’ ? 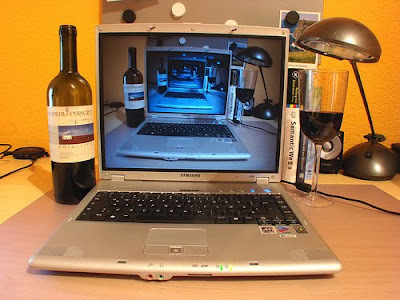 Digital name calling aside, I am a huge advocate for all things about ‘wine online’ ! So, I am VERY excited to share with you what was talked about in Part 2 of the Pre ‘London International Wine Fair’ Conference … “Making the Most of Online Media”!! The first presenter was someone very, very special to the wine world. She is a wine celebrity of sorts and I have been wanting to meet her ever since the wine bug bit me! Her name is Jancis Robinson. So for those of you ‘non-wine dorks’ out there who are scratching your _____ and saying, “Um, ya, that name is doing nothing for me, and it sure as heck ain’t ringing any bells,” … let me introduce you! ???? I don’t get it … I tried to turn the web-cam onto the computer screen to show everyone to Jancis, but this is what it showed ??? I am so confused. I know. I’m a dork, but you love me for it! Moving on …. ah yes, I still owe you ‘non-wine dorks’ an introduction to Jancis Robinson! I will resort to bullet points for this one. Jancis is a british wine critic, journalist and editor of wine literature. She is the wine correspondent for the Financial Times. She provides advice for Queen Elizabeth II’s wine cellar!! Jancis is considered one of the world’s leading writers of “educational and encyclopedic material on wine.” She is famous for The Oxford Companion to Wine, pretty much the bible for the wine world. She also co-wrote The World Atlas of Wine along with another famous wineaux, Hugh Johnson. It is one of the world’s leading wine atlases. With that sort of an introduction, you can imagine what a WOW it was to have her open the second part of this conference. But what does she have to do with ‘wine online’? Well, she has a very popular and highly regarded website, www.jancisrobinson.com, which she refers to as her fourth child =P! She also has an incredible 26,963 followers on her Twitter account and has a YouTube Channel … sooooo… she is kind of a big deal with kind of a large following. She has been one of the few ‘traditional’ wine guru/critics from the pre-internet days who has been smart enough to ‘roll’ with the times and embrace the shift to ‘online ‘ instead of fighting it. At the conference she told us she launched her website in December of 2000, when she said, “the world decided that gold was at the end of the rainbow that went through cyberspace.” She laughed and continued to say how, much to her surprise, she found it “seductive” and found herself excited to update her website every day! There was no way she could keep up this new found passion and still keep the content free of charge, so in December of 2001 she decided to add a paying section on her website where she kept all the ‘good stuff’. She said she not quite sure how her readers would take to that, but they welcomed it with open arms! (and wallets!) She actually shared with us how last month was the best month ever for figures on membership to her paid section called the ‘Purple Pages’! She said the benefits for having her own www. is that it’s a place where she can work more (she is self-diagnosed workaholic) and she has a place to publish ALL her tasting notes. You thought I taste a lot, this woman puts me to shame! She said it is also a great campaigning tool to spread the word about events/books/wine/etc. Lastly she said she is grateful for having her www. because it a great reception of information. She learns so much from the comments people make and all the other info that is sent her way. The down side she said, was that having a website can be unforgiving, as it HAS to be up-to-date. “It is better not to have a website than to have one that was last updated 8 months ago,” she said. Jancis gave a wonderful and very entertaining talk about her personal experience/success with making the crossover from print to online media. She is a great example to so many in the wine industry who are afraid or hesitant to accept the new ‘wine online’ movement. They can’t keep ignoring it, and with a little keyboard grease, the fearful can share in the online wealth too! For those who are intrigued and want more! Here is an awesome 3 part interview with Jancis Robinson I found on a rockin’ wine blog/online wine show called Wine On The Rocks. Enjoy! Now there were still other presenters for this second part of the conference, but I am going to stop here for now. This part of the conference was really interesting to me and I want to give each of the presenters their fair share of the spotlight. That being said, if i posted about all of them in one post, you would be here for quite a while and I don’t want your boss to walk by and catch you reading Vinously Speaking! I will see you next time for the next presenter for “Wine Online” at the pre-London Wine Fair Conference!! I always buy wine based on the label. I figure that any winery that has the good taste to hire a good designer and creates an attractive bottle. probably also has the good taste to fill that bottle with good tasting wine. not universally true, but I'm not frequently disappointed. Well each person has their own choosing style! =) I know plenty of people who buy wine based on the same thing, a well put together label. I would venture to say that a large percentage of wine consumers choose their wine the same way you do. And hey, it makes for great decoration once the bottle is empty, or in a wine label diary!